It starts with the 24-carat gold leaf lettering on the door. And continues with an entryway fashioned from old boards covered in long-ago forgotten Boise newspapers. Then it opens up to a room full of tiny, disparate details that come together to make a cohesive bar and lounge space. Almost exactly 90 years after the Fidelity Building first opened at 8th Street and Idaho Street in Downtown Boise, it has a new look that feels like a step back in time. 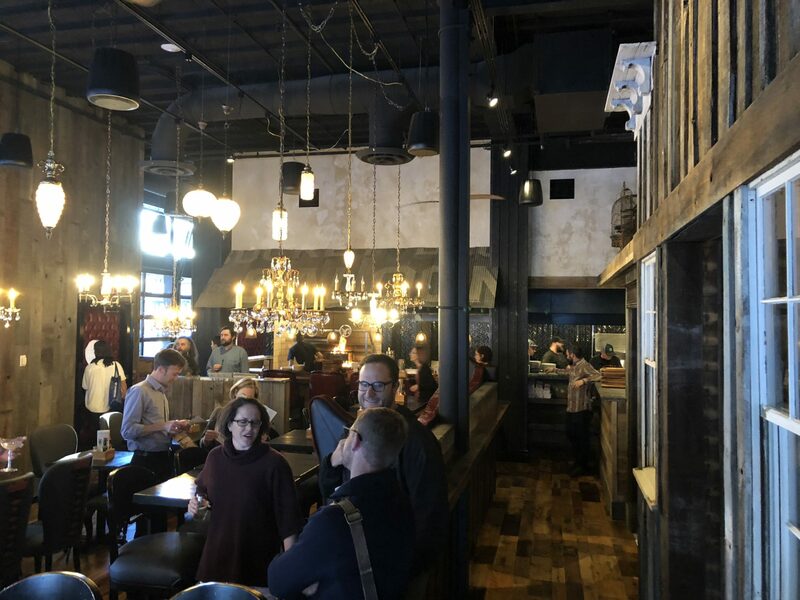 Diablo & Sons Saloon is the latest offering from Boise restaurateurs Dave Krick and Jami Adams, just a stone’s throw from their more established eateries Bittercreek and Red Feather a few doors down. 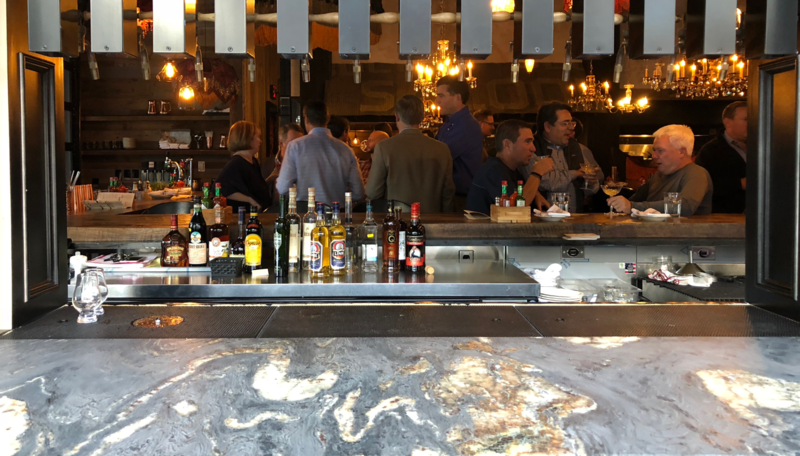 But while the new space has some of the DNA of the associated restaurants, it brings a different feeling and vibe to the downtown dining scene. The idea, according to those involved with the launch, is to build something that helps define what Boise is. “Some people want us to be Salt Lake City and some want us to be Portland. We want it to be Boise,” said Justinian Morton who helped fashion and designed the interior. 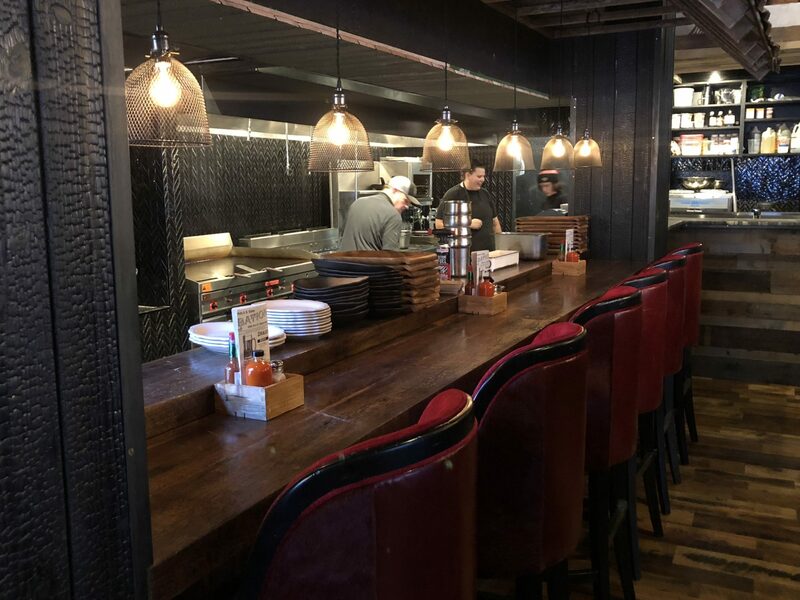 For months, crews worked behind a graffiti art-adorned wooden wall revamping the former fast-casual Mexican joint Pollo Rey into a completely new concept. But despite the Spanish word ‘Diablo’ on the front door, the new restaurant has very little in common with the old. The interior bartop backs up to Idaho street. On the opposite side is a geothermal-heated bartop for sidewalk patrons. Photo: Don Day/BoiseDev. The drink menu is extensive, with dozens of lagers and ales on draught, plus cocktails, wine and a selection of unique bottled beers. Through the windows on Idaho Street, pedestrians may have noticed a long series of taps. The spouts are made in the Czech Republic by Lukr, and allow the lagers to be served either crisp or smooth according to Roberts. Local beers like the Snake River See You in Helles and Woodland Empire’s City of Trees sit alongside offerings from around the world. Cocktails include the Pink Thing – with Spanish vermouth, prickly pear, lemon and prosecco and the Hot Apple Drink – with rum, rye, mezcal and house cider. The new exterior bartop will extend on to a future patio set to open next spring. The surface of that bar is actually warm to the touch, heated with geothermal water. 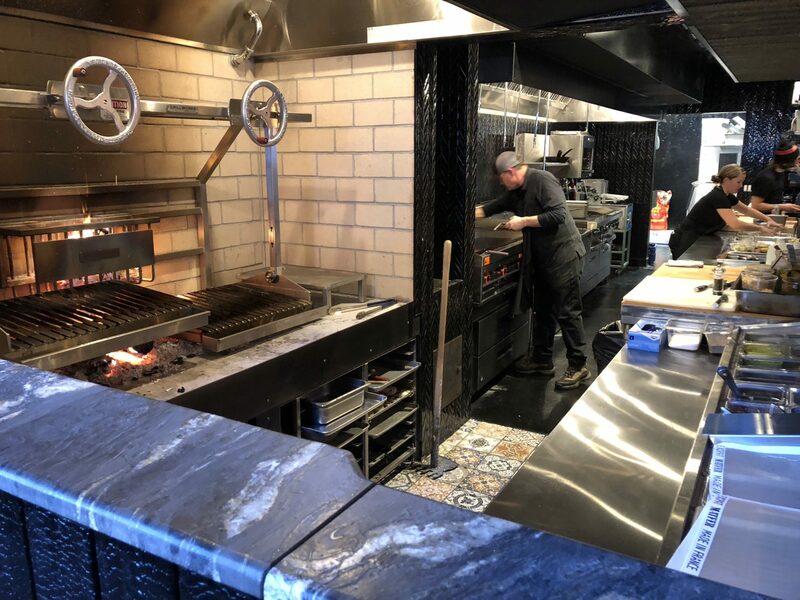 On the other side of Diablo & Sons is a large open kitchen with an open-fire feature that prompts dishes like the wood-grilled burger, barbecue beef ribs and t-bone tacos. Robert said the menu is designed with Boise in mind. Instead of dishes heavy on tomatoes, which are hard to source locally in the winter, it goes a different direction. “The menu prominently features corn because it is an ingredient that we are able to access year around from responsible and ethical suppliers,” he said. A number of tacos are served, but with a less-than-typical spin. Varieties include chile strip, deviled crab and lava lake lamb. Morton has been working on the project for so long, he couldn’t put a date on it. Many of the materials that make up the bar have been in his collection for years, he says. 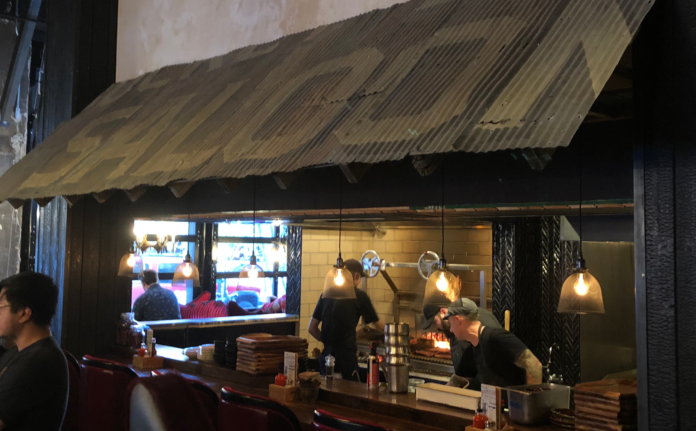 Over the kitchen hangs a large corrugated metal awning. 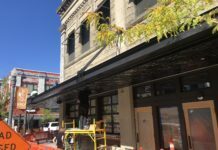 Morton styled it to pay homage to a ‘notorious’ Boise saloon called the Bucket of Blood – with fragments of the former bar’s name shown on the sign. In the entry vestibule along 8th street are boards Morton salvaged from an old Boise building. 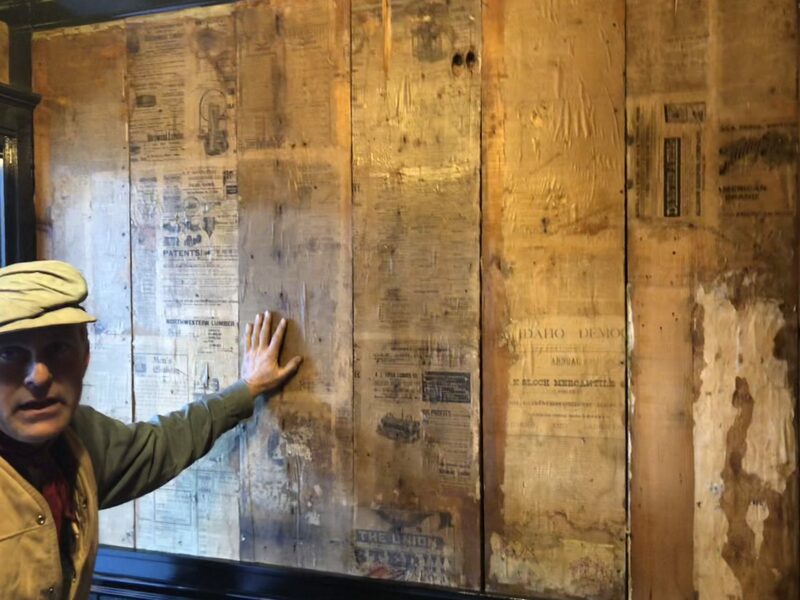 The boards are covered in vintage Boise newspapers used to smooth out the wood before applying wallpaper. Some of the papers are from the Idaho Democrat, which existed for just a year right around Idaho Statehood according to the Library of Congress. Morton shows off his work in the entry way. Photo: Don Day/BoiseDev. Morton said some of his ideas are a little out there, but Krick and Adams have embraced them. 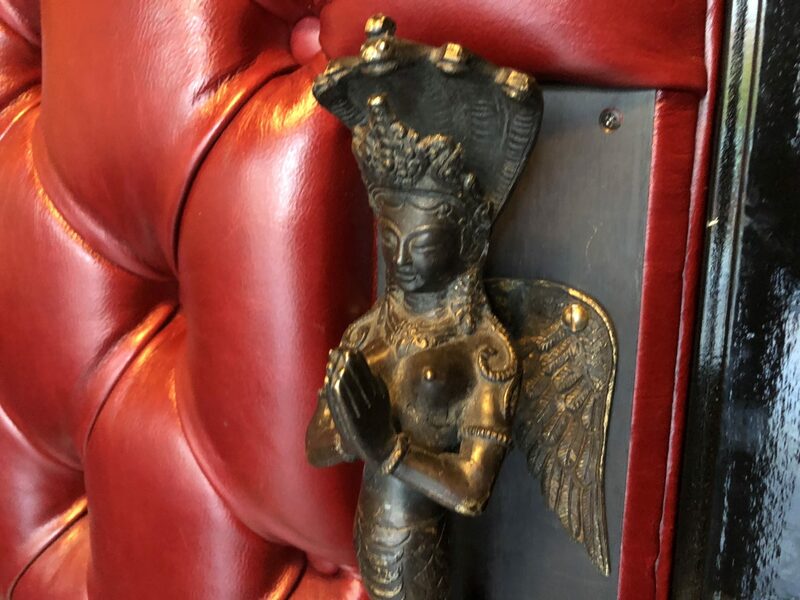 Morton was proud to show off many of the intricate details, including that gold-leaf sign on the front glass, chandeliers from Adams’ private collection, wood from the roof of an old tobacco barn and a wall-covering made from an old fence. The front of the walk-in chiller is clad with custom woodwork Morton built up from 100-year-old flat boards. 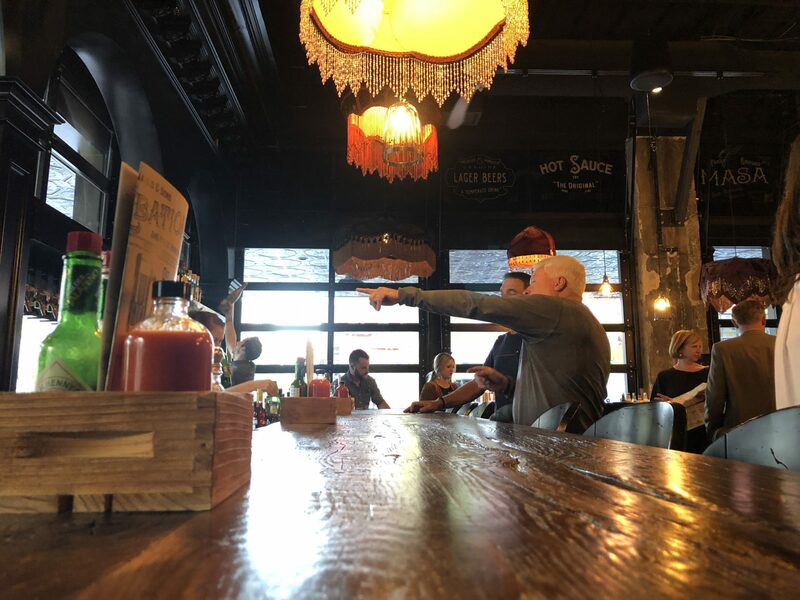 After a few preview events, Diablo & Sons Saloon will open to the general public Tuesday, October 23rd at 246 S. 8th Street in Boise. It will be open for lunch and dinner with a late-night menu that goes from 10pm “’til late.” The saloon will not be on Mondays at first. Roberts said the down day will give them the chance to tweak and adjust. The outdoor patio won’t open this year, but will start seating next spring. The added space will almost double Diablo’s capacity according to Roberts. Sunday brunch will also be offered down the road a bit. Prices for food range from $2 for one of taco options to $25 for a king salmon steak. Cocktails are in the $10 range, with beers around $5 for a half liter glass. Looking forward to seeing your new place. Sounds fantastic! !